Sindhu, who has become one of the world's highest-paid female athletes since winning Olympic silver in 2016, says she has her eye on the number one spot. Saina faces World No 1 and top seed Tai Tzu Ying of Chinese Taipei, while Sindhu will take on either China's Chen Yufei or World no 2 Akane Yamaguchi of Japan. PV Sindhu’s demolition of Cheah’s challenge sets her up for a Saturday meeting with Gregoria Mariska Tunjung of Indonesia, ranked a modest No 29. Star player Akane Yamaguchi got Japan off to a flyer, beating Ratchanok Intanon 21-15, 21-19 in the first singles match. We are looking at arguably one of the underdogs of the tournaments in Ruthvika Shivani Gadde as it would be foolish to rule a fit Gadde out after what she has achieved in the past. 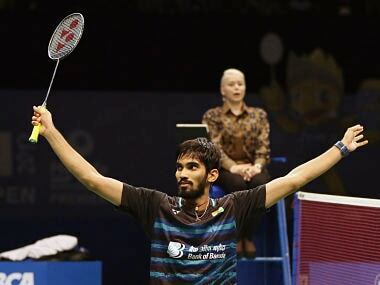 The World No 3 Indian recovered from a mid-way slump to overcome the Thai shuttler 21-13, 13-21, 21-18 in an an hour and seven minutes. Prannoy showed a familiar control over length of stroke that is the hallmark of his game, and the unhurried defence in the face of some of the most powerful smashes struck by the wiry Lee Chong Wei. Sindhu had to battle hard in the opening game with World No 16 Jindapol managing to grab a 9-7 and 13-10 lead but the Indian broke off at 14-16 with six straight points.